I read an interesting article recently. It discusses the fact that nonprofits know they need more diverse boards of directors but are not doing a good job achieving that diversity. 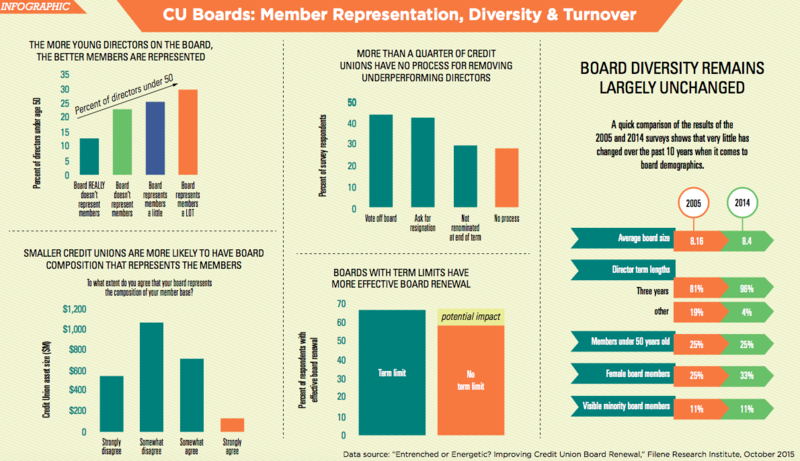 It reminded me a lot of credit unions and the need to diversify your boards to more closely reflect your membership and potential membership. This infographic shows some eye-opening data on perception versus reality when it comes to member representation. One statement, in particular, highlights the issue: “Seventy percent of organizational leaders consider staff diversity an extremely important goal, but only 36% think they’ve actually achieved it.” That disconnect between the goal and the actual achievement is only one of the barriers noted. Maybe the best place to start is to have the conversation. Where does your board think you are with diversity? Where do you want to be? Once you establish those benchmarks, you can formulate a plan to work toward the goal. In working on this topic, keep in mind that “diversity” is broader than gender, age, and ethnicity. It might also include having board members from outside the same employer at the table. We’ll come back to the issue later this fall, once you have talked about it a bit.